Leadership plays an important role in the workplace as well as other community organizations. Leadership activities are associated with benefits to business, including increased performance and productivity. However, perhaps the sign of a truly successful leader is a happy, healthy workplace. Interested in what leadership activities can do for your workplace or school? Read on. With the activities below, there may be some overlap with activities found under certain headings – for example, activities suitable for adults may also be applied in groups, or with employees. Increasingly, people are assuming positions of leadership in the workplace (Cserti, 2018). However, the journey to becoming a leader is lengthy (Cserti, 2018). Leadership activities are valuable on the journey to becoming an effective leader, and also develop confidence in leadership teams (Cserti, 2018; Stepshift, 2016). Leadership activities may be conducted on or off site, and be physical or sedentary (Stepshift, 2016). Leadership activities can either be performed by a leader in their own team, or with an external facilitator (Cserti, 2018). They may take the form of specially organized themed events, such as scavenger hunts (Stepshift, 2016). Or, they may be smaller, office-based tasks built into an ordinary workday. For example, leadership activities could consist of meeting openers or conference break activities (Stepshift, 2016). Leadership activities can be an effective way for individuals to practice and strengthen their leadership and team-building skills (Cserti, 2018). They can also be fun! The structure of leadership activities is essential. It is important that the participants can relate the activity to the workplace setting (Stepshift, 2016). Leadership activities are used to help individuals learn important skills to be an effective leader and to promote the growth and development of a leadership team (Stepshift, 2016). Leadership activities can be used to improve teamwork, foster better communication in the workplace and develop team cohesion (Cserti, 2018). The working style, principles, and values of a leader is a crucial aspect in determining the behavior within an organization (Cserti, 2018). Leadership training can help leaders become role-models (Cserti, 2018). The behavior of leaders and what they consider the “norm” determines which behaviors are enforced and those which are punished (Cserti, 2018). Leaders need to develop the ability to clearly, succinctly explain to employees everything from the goals of a company to the details of specific work-tasks (Doyle, 2019). Many components are important for effective communication, including active listening, reading body language and written communication such as emails (Doyle, 2019). Leaders need to inspire employees. They may do this by increasing worker’s self-esteem, by recognizing effort and achievement, or by giving a worker new responsibilities to further their investment in the business (Doyle, 2019). Leaders can achieve this by identifying the skills that workers have, and as such assign tasks to each worker based on the skills they have (Doyle, 2019). Being positive helps develop a happy, healthy work environment, even when the workplace is busy or stressful (Doyle, 2019). By demonstrating integrity, workers will feel at ease to approach their leader with questions or concerns (Doyle, 2019). Building trust is one of the most essential leadership skills. Good leaders are willing to try novel solutions or to approach problems in a non-traditional way (Doyle, 2019). Leaders are constantly on the lookout for opportunities to provide team members with information about their performance, without ‘micromanaging’ their work (Doyle, 2019). A good leader accepts mistakes or failures and instead look for solutions for improvement of a situation (Doyle, 2019). This skill also includes being reflective and being open to feedback (Doyle, 2019). A leader should strive to follow through with everything that they agree to do (Doyle, 2019). It also involves applying appropriate feedback and keeping promises (Doyle, 2019). Leaders need to be able to accept changes and creatively problem-solve, as well as being open to suggestions and feedback (Doyle, 2019). While these skills are explained in a workplace context, they can easily be applied to other leadership situations such as sports or community groups. Now that you have more clarity as to what leadership activities are, and what they are used for, let us look at a wide selection of activities. While some of the activities and games may not immediately appear to be ‘leadership activities,’ the chosen activities might develop and promote the leadership skills outlined above. Formal leadership activities certainly make up what is generally thought of as ‘training’ or ‘development.’ However, many activities offer leadership development, without the person realizing they are engaged in learning how to be a leader. Sports provide the experience of being a team member and developing leadership skills (Flavin, 2018). Experiences with a different culture provide new, potentially uncomfortable situations and help develop communication skills that may not be learned elsewhere (Flavin, 2018). Overseas travel, or working with a different cultural group within your community can provide an opportunity to learn new skills, or may involve barriers that must be overcome – all teaching leadership (Flavin, 2018). Involvement in social activities helps potential leaders develop a well-rounded, confident personality which enhances their capacity to lead a team (Flavin, 2018). Taking an internship position demonstrates initiative in finding opportunities to learn and seeking practical work – valuable skills in leadership (Flavin, 2018). As well as showing ambition, volunteering shows that you are willing to commit yourself to something that you are passionate about (Flavin, 2018). Specifically considering students, being involved in co-curricular organizations help individuals develop leadership (Flavin, 2018). Being involved in student government or organizations can provide opportunities to demonstrate leadership and have an impact on those around you (Flavin, 2018). Showing commitment to a passion for better communities; for example, mentoring shows that you are likely to focus on the greater good for a team (Flavin, 2018). This can be anything at all, from helping out with planning a family event or participating in a volunteer day, will demonstrate and develop leadership skills (Flavin, 2018). Effective leaders are aware that continuing professional and personal development is the key to ongoing success (Higgins, 2018). As such, they recognize that leadership workshops are important (Higgins, 2018). What activities can be used in such a workshop? Participants are provided with everyday items such as toothpicks, wooden blocks, uncooked pasta and so on. The task is to build the tallest possible free-standing structure from the materials provided. This activity is designed to encourage creative problem-solving and developing collaboration skills. Select four team members as volunteers. One team member plays the role of an employee who has missed meetings or been late to work in recent times. Each of the other three participants demonstrates a different style of leader (to save time, nominate the particular personality trait). Ask all participants to form a circle, and put two chairs in the middle of the circle. After each demonstration of how to deal with the employee, ask the whole group to reflect on the different leadership approaches. For example, the group could consider what worked and what did not. Finally, to conclude this activity, ask the group to consider what the ‘ideal’ leader would do in the scenario. This activity helps build trust and improve communication skills. It involves participants working in pairs, with one team member being blindfolded. Then, using only specified communication techniques, the pair negotiate their way around or over a ‘minefield’ of obstacles. So, for example, the participants may be told they are only able to use commands such as the words ‘left’ or ‘right,’ ‘forwards’ or ‘backwards.’ The aim is to help the blindfolded team member to navigate the ‘minefield’. Provide a small tarp or rug, which has enough room for all workshop participants to stand within its boundaries. Then, inform the group that their task is to work together to flip the rug or tarp over without any participant stepping off. If (or when) a participant steps off the teams have discussed all of the paragraphs or tarp, the team must begin again. There are three different ‘leadership styles’. These are: autocratic (also known as authoritarian), delegative (also called ‘free reign)’ and democratic (which is also called participative) (Clark, 2015; Johnson-Gerard, 2017). An autocratic leader makes decisions without first consulting others, while a delegative leader allows the staff to make the decisions (Johnson-Gerard, 2017). Finally, a democratic leader consults with the staff in making workplace decisions (Johnson-Gerard, 2017). Here is an excellent resource for exploring different leadership styles. The workbook also provides some helpful worksheets. The following two activities help participants think more deeply about styles of leadership. The group should be divided into small groups of 3 – 4 participants. The participants work in groups for the first activity, and then they work individually on the second activity. Provide a list of approximately 10 – 12 scenarios displaying the three different leadership styles. For example, “a new supervisor has just been put in charge of the production line. He immediately starts by telling the crew what change needs to be made. When some suggestions are made, he tells them he does not have time to consider them”. The group then works together to figure out which leadership style is used in each scenario and to talk about whether it is effective, or if a different style could work better. Encourage participants to think about themselves in a similar situation and their reaction to the particular leadership style. Provide participants with the statement ‘consider a time when you, or another leader, used the authoritarian (autocratic), participative (democratic) or delegative (free reign) style of leadership’. Ask participants to reflect on the statement and make a few comments, such as: was it effective? Would a different leadership style have worked better? What were the employees’ experiences? Did they learn from the leadership style? What was it they learned? Which style is easiest to use (and why)? Alternatively, nominate the style which the participant prefers (and why). To conclude these two activities, come together as a whole group and discuss what was learned about the three styles of leadership. The aim of this game is for participants to reflect upon different leadership styles and come up with a list of actual workplace scenarios which would need a leader to abandon a natural leadership style for one that is more effective (i.e., to ‘jump ship’). Each group is given three large pieces of paper. Ask the teams to write one style of leadership on each (i.e., autocratic, delegative, democratic). Then, allow the groups 45 minutes to come up with real work situations for which employing the particular leadership style would be disastrous. Ask the groups to place the sheets of paper up on the wall, and to discuss the sheets as a team. As a whole group, review the posters. Each participant begins by writing a one-paragraph description of a work situation that is not going well. Collect these, and at the top of each page, number them in consecutive order. Then, divide the participants into two teams. Give each team half of the paragraphs. Then, ask the teams to choose the style of leadership that would be the least and the most effective in solving the problem. Have the teams note their answers on a piece of paper, being sure to identify the paragraph number on the top of each page, and their choices. Then, ask the teams to swap paragraphs and repeat the activity. When the teams have discussed all the paragraphs, discuss the scenarios and review the choices as a group. Where the team’s choices are different, discuss as a group. This particular activity enables participants to devise a 3-to-5 step decision-making process they can use when challenging leadership situations occur. Ask participants to form pairs. Then, ask them to come up with the steps that an effective leader goes through in order to work out how to manage a difficult situation. After about 30 minutes, ask each pair to review the steps they have come up with for the group, and to write them on a large piece of paper. Ask every pair to review their process, and after all the pairs have done so, have a group discussion that enables a consensus to be reached about the three to five most effective steps to take in a difficult leadership situation. the team chose the specific 2 brands/logos help children develop leadership skills, it is not terribly important what sort of activities they take part in. What is important is to discover the leadership activities that children will find enjoyable and benefit from (Pennsylvania State University, 2012). Provide children with materials such as textas, crayons, poster/construction paper, magazines, and scissors. Then, ask them to draw themselves, using things that clearly show that the picture is theirs – such as using cut-outs of their most favorite things to do, foods they like, pets, and whatever else makes them unique. Once the children have finished their posters, they can show their completed work to the other children – helping kids to improve their confidence to lead. The children sit in a circle. Ask the first child to point to another child in the circle who is similar to them, either in appearance, hair-style or clothing color. Then, when the child has chosen someone, as them to note other differences and similarities they have with the child they have chosen. Ask children to form groups of four or five. Then, have the children select a leader for their team. Each participant is given a spoon and an egg. The leader has the task of finding an effective way to move the eggs from one point to another. For example, one option may be for children to form a line to pass each egg along. Another leader may suggest forgetting about the spoons altogether and merely tell their group to make a run for it. The winner of the game is the group that can get their egg safely across the finish in the most creative way. This game requires a large indoor or outdoor area. Divide the children into two groups and give them enough blindfolds for everyone except one member to put on. The teams are placed at opposite sides of the space. The child who is not blindfolded is required to lead their team to the other side of the designated space, using clear commands. Ensure that each member of the team has an opportunity to lead their team. The winner is the team which sees its members successfully cross the finish line. Help children support a charity by organizing a fundraiser. Each child can have a different task. For example, one child may select the charity, another may find a suitable space to hold the fundraising activity, and another child can collect donations. Teach children to divide a large task into smaller steps. Set the children a large task, such as holding a class function. Show the children a plan that enables them to achieve the task step by step. This activity can involve a number of children sharing tasks. Suggest to the children how they may be able to improve. Volunteering plays a role in leadership. Discuss with children how they would like to help someone in need. Older children may be interested in taking a role in an organization in their community. The children should be helped to select a volunteer opportunity that gives them a chance to practice leadership and work with other children. In this task, ask students to be prepared to evaluate an experience when it is over. Then, after the experience, ask the child questions. For example, inquire “Do you remember the name of the dog we saw?”, “What was it?”, “Did you touch the dog?”, “What is the owner’s name?” and so on. This is an excellent introduction to leadership for kids in grades 4 – 6 (children aged approximately 9 – 12 years). This looks at what a leader is, and what their role can and should be. This worksheet examines leadership role models and the qualities we see in them that we want to develop in ourselves. This handout focuses on leadership attitude. Links to 45+ reviewed resources for teen leadership which can be accessed free by registering your details. This partnership has created a comprehensive manual for promoting leadership for teens aged 13 – 17 years. The manual outlines a number of sessions which guide leadership development activities. This is a fun, engaging and introspective activity. It is suitable for students aged 13 and upwards, so it can be used with older students or adults too. Make an agreement that you and the student(s) will refrain from talking about yourselves for a whole day. Ask them, rather, to listen to others, and if they do talk to another person, it should be about the person whom they are talking to. This game helps children to learn how important it is to focus on other people rather than themselves, which forms the basis of ‘relational leadership’. 2. Silence Classroom Leadership Game (Stapleton, 2018). To begin the activity, the teacher divides students into two teams, and the teams move to either side of the classroom. The desks may be pushed aside to create more space. The teacher instructs the students to, for example, ‘line up according to the first letter of your surname’ or ‘arrange yourselves into age order by the month your birthday is in’. The students then follow the directions without speaking a word to one another. Students are permitted to use hand signals, or even write instructions down on paper. The teacher’s instruction to the students is that they are not allowed to talk. The winning team is the one that completes the task successfully. Divide students into pairs and select one student to be the leader. Each team should face each other standing up, with a plastic cup in the middle. The leader calls out simple directions, such as ‘touch your knee’, ‘close one eye’ and so on. When the leader calls out “cup” the students should try and be the first to grab the cup. The player who successfully grabs the cup should pair up with another player who also got the cup. Those without a cup sit down and watch. Once the new teams of two have formed, the cup is put in between the players and the game begins again. This process continues until only one person is left standing – and the resulting winner becomes the new leader… and play can begin all over again. By high school, students are more sophisticated. Here are some interesting activities for high school students to develop leadership. The teacher puts students into groups of 4 or 5. The goal is for students to come up with possible solutions to social, political or economic problems. Working together, students brainstorm both small- and large-scale solutions to a given problem topic. Once the groups have finalized their list of detailed solutions, the teacher facilitates a discussion with the whole class, and together they examine which of the identified solutions could be a viable option and why. The teacher puts students into pairs or groups of three. Then, each group member shares a story about someone whom they consider to be an influential leader. After each story has been shared, students discuss the characteristics that they think made the person in the story an effective leader. Once each student has shared a story, students compile a list of all the characteristics of an influential leader they identified. Post these characteristics on the walls around the classroom. The teacher arranges the students into a single line, and comes up with a starting point and finishing point. Then, the teacher places a blindfold on every student except for the student who is at the front of the line. The teacher tells each student to put their left hand on the left shoulder of the person in front of them. Next, the teacher says “go”. The aim is for the leader (who is not blindfolded) to walk towards the finishing point, providing instructions to students behind, who are blindfolded. An extra challenging game sees the teacher putting obstacles in the path – the leader must direct followers on how to avoid the obstacles and successfully reach the finish line. When this goal is achieved, a different student takes a turn of being the leader. This game aims to move all the balls from one box to another. The catch is, team members cannot use their hands or arms. In equal sized teams, players choose one ‘handler’ per team. This is the only person who can touch the balls with their hands. The handler must remain behind the start line throughout the game. Team members attempt to get balls from their bucket at the finish line, and get them to the team’s handler without the ball touching their hands or arms. The handler places the balls into the empty bucket at the start line. If a team member touches the ball, they are disqualified and can no longer participate. Give teams a 5-minute time limit. All teams play at the same time, and the team that has the most balls in the handler’s bucket at the end of the game wins. Two teams have to complete a jigsaw puzzle within a 20 – 30-minute time limit. Give each team a box containing a puzzle. At first, A body will assume that their task is to complete the puzzle. As they work on it, however, teams will realize that the puzzle is missing some of its pieces and has some additional pieces that do not fit their puzzle. Teams then have the task to communicate with one another, and they will eventually realize that they need to work together to complete the puzzle. Teams are only allowed to exchange pieces of the puzzle one at a time. Divide participants into two teams. Build a structure out of Lego. Make it complicated, but able to be replicated. Ensure that there is sufficient Lego left to build two similar copies of the structure. Make sure that this structure is kept out of eyesight. A player from each team is allowed to see the structure for 10 seconds. Then, the players will return to their respective teams and have 25 seconds in which to give his/her team instruction as to how to build the structure. Then, the teams have 1 minute to build the structure. When that minute is up, another team member takes a look at the structure for 10 seconds and has a further 25 seconds to deliver their instructions to their team. This process continues until all the team members have had a chance to examine the structure and provide instructions. The team that successfully built the structure is the winner. “The Leadership Training Activity Book” by Lois. B. Hart and Charlotte S. Waisman (2005) contains 50 handouts for leadership activities that would be suitable for college students. This resource provides helpful leadership tip sheets that are suitable for college students. Examples of tip sheets are “ten keys to effective listening” and “basic confrontation guidelines”. Another valuable resource that can be used to develop team building – an aspect of leadership. This resource provides a range of fun activities suitable for college students, including topics such as culture change and mission statements. In this activity, teams use spaghetti sticks, tape and string to construct the tallest free-standing structure. They are given one marshmallow, which must be placed at the top of the structure. Devised by Tom Wujec. This game is convenient in that it requires no materials. It involves two people. They sit on the floor, facing one another. They hold hands, and the soles of their feet are placed together. Then, the task is for both people to stand up at the same time. This game builds trust and teamwork, and also develops skills in problem solving and collaboration. A set of randomly provided sequential pictures are given to the participants. The task requires participants to put the pictures in the correct order to recreate the story, without knowing which pictures the other participants have. This activity can be an effective way to improve communication, patience, and tolerance. To harness creativity and reflect on leadership concepts, one activity for adults is to write a poem. This activity can be done individually or in small groups. The aim is to consider leadership in creative ways to find new perspectives. This activity can help adults develop leadership. It does so by providing a self-assessment tool. People begin by identifying the skills, attitudes, and attributes that they consider being important for successful leadership. The individual then rates their own development in the defined areas. The framework can also provide a helpful tool in assisting adults in identifying their leadership development goals in a coaching session. Each participant considers a role model who they admire. They then think about a young person they know. If the young person was to ask the role model for leadership advice, what kind of advice would the role model give? In groups, discuss and share the sort of advice identified and talk about contradicting points and how they can be reconciled. This sharing discussion may be a practical introduction to the idea of situational leadership. This outdoor activity challenges a group to physically provide support to the group members behavior move from one end of a designated space to the other. Participants are told to pretend that the whole team must cross a wide river which contains dangerous crocodiles. Magic stones (which are represented by wooden planks) provide the only supports to be used to cross the river (which has ‘banks’ that are marked out by two ropes). These ‘stones’ only float on the water if there is constant body contact. These ‘stones’ (i.e., the wooden planks) are placed next to the ‘river bank’ – there should be one less plank than the total number of participants. As part of the game, if a participant’s hand or foot touches the ‘water’, it will be bitten off (if this happens during the challenge, the participant must hold the hand behind their back). The facilitator then pretends to be the ‘crocodile’, keeping a close eye on the group as they attempt to cross the river. When one of the stones (the planks) is not in body contact, it is removed. When participants mistakenly touch the ground with their hands or feet, tell them that the limb has therefore been bitten off and the player must continue without using it. This activity continues until the group succeeds in getting all group members to the other side of the ‘river’. If anyone falls in, the group is deemed to have failed, and they must begin the river crossing attempt again. This activity focuses on one of the most critical elements of leadership: regular, constructive feedback. Openness creates trust, which then promotes further openness. This activity is designed to be used by a group that has spent sufficient time together in order to have a range of shared experiences they can draw from when they are providing feedback. In groups of around 4 to 6 people, participants complete these sentences on one post-it for the other participants in their group. If they cannot think of relevant feedback for one of the prompts (i.e., start, stop, continue), they do not need to include it. Once the group has finished writing, they provide the feedback verbally, one at a time, and afterward hand the post-it to the relevant person. Four tables are set up with different tasks. Each task has separate steps that participants can be responsible for carrying out. The group select a team member, who is only allowed to communicate and delegate tasks but not take a part in the task. Each table is timed to record how long the task takes to be completed. Round Tables improves leadership and delegation skills. This game requires participants to stand in a circle and hold hands. One person in the group has a hula hoop around their arm. The game aims to pass the hula hoop the whole way around the circle. As well as promoting teamwork and problem-solving, this game develops communication skills. Being able to communicate effectively is a crucial skill for any successful leader to have. One key responsibility of the leader of a team is to encourage team bonding. One way to facilitate bonding is improvisation. ‘Improv’ develops skills in communication – helping teams to listen and pay attention. It also builds self-awareness, self-confidence, and creativity. Arrange the group into ‘audience’ and ‘performers’. Then, members of the audience take turns in calling out the specified location, profession, and scenario (e.g., coffeehouse, cop, and purchasing a donut). Chosen suggestions are fun and should promote creativity. This game requires a rope that is tied at both ends to form a loop. The loop needs to be big enough for all group members to hold onto with both hands as they stand in a circle. The group is instructed to make a chosen shape (e.g., circle, square, triangle). The group attempts to create the shape on the floor. Progressively, ask the group to make more complex shapes – e.g., a dog, or a tree. To add another layer of difficulty, instruct the team to communicate without talking – i.e., to rely on hand gestures. Afterward, have the group reflect on their experience and discuss the importance of communication. To begin this activity, employees individually take the role of three different people and brainstorm the particular behaviors that each person’s most favorite and least favorite managers demonstrate, from the chosen person’s perspective. 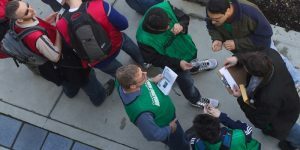 After the employees have had the chance to reflect, the participants compare their list of behaviors – in pairs, and then subsequently, in groups. The teams then prepare a list of ‘dos and don’ts’ for developing better employee perceptions of the leader’s style. The values of a leader are reflected in their organization. In this activity, each participant writes ten things that they value most in their lives, each one on a post-it. Then, ask the employees to spread the Post-its in a way in which they can see them all clearly. Then, explain to them that they will have 30 seconds to select the three Post-its that are of least importance to them. It is essential to time strictly, so that the participants rely on their gut feelings. Repeat the process, this time allowing participants to have 20 seconds to discard two more values. Finally, give the participants a further 20 seconds to thrown another two away. Participants should have three Post-its in front of them, showing their top three important values. Following the activity, have participants reflect individually for about 15 minutes about what was found, and then to discuss reflection questions in pairs or groups of three. Because this activity is done quickly, participants are encouraged to follow their own intuition – rather than over-thinking and finding what they perceive to be the ‘right’ values. 3. ‘Leadership Coat of Arms’ (Cserti, 2018; Landau, 2018). Each leader has their own values and the things that they consider valuable and important. These values guide the behavior of the leader and make up a person’s unique leadership philosophy. This activity sees participants drawing their own ‘leadership coat of arms’ embodying their leadership philosophy. Individuals have 10 – 15 minutes to draw their coat of arms. They can divide the coat of arms (or ‘crest’) into four sections. To fill each section, consider the categories of leadership skills, values that help influence others, recent achievements/accomplishments and what you like most about your current work. They should be encouraged not to be overly concerned with how visually appealing their picture is but rather that it expressed what they personally believe to be important aspects of a leader. Once the drawings are complete, the participants can show their drawings to the others in the group and explain their unique coat of arms. It is also helpful to reflect on the activity – consider which section was easiest to complete and whether your crest reflects your company’s values. Divide employees into groups of four to seven people. Each group should be given two sets of blocks (such as Lego). Each set should have a minimum of 10 blocks. Beforehand, you should construct a sample object (e.g., a house) from one of the sets of blocks. In each group, select a leader, a delegator, a builder and a note-taker. The note-taker watches and records the group’s behavior during the task. They take note of what appeared to be done well and how employees could improve. The leader is given the item that you built – however, they are the only group member to see the object. Set a timer for ten minutes. To begin with, the leader describes to the delegator how the builder should build a replica of the item. However, the delegator does not see the object, and at this stage of the activity, the builder should not hear the instructions. The delegator can speak with the leader as often as necessary during the 10 minutes. The builder attempts to build the same item that the leader can see. However, they are only relying on the delegator’s instructions. At this stage, the delegator should not see the object that the builder is constructing. When the time is up, reveal both objects to all participants and see how closely they match. Finally, to wrap up the activity, employees can discuss what was either frustrating or easy about the process and discuss how they may do things differently in order to achieve better results. Begin a meeting by saying to the group – “the seating arrangement is totally wrong for today’s meeting. You have 60 seconds to improve it”. If the employees ask further questions, only repeat the instructions. While some employees may continue asking questions, others may start moving the furniture around straight away. Observe the team and what they do without giving any further information, feedback, or instructions. After 1 minute, let the employees know to stop. Then, ask them whether the objective was achieved, and how. Discuss with employees how and why a lack of clarity makes it challenging to complete a task. Then, discuss who asked for clarification and how they felt when the leader refused to give further details. Use this opportunity to highlight to employees how if they fail to ask questions, and when the person in charge of a project doesn’t provide the necessary clarification, the whole team is at risk of making mistakes or even not completing a task. Finally, ask how the time pressure affected behavior. Discuss how employees may be more likely to respond to pressure, or stress, by taking action without first confirming a plan and the significant problems this approach can lead to. Present different hypothetical problematic scenarios to employees. Either individually or by providing a document that requires written answers, present situations such as “you didn’t follow the rules, and subsequently lost an important client. You have lost a lot of money for the company. How do you justify this? What is your solution?”. The questions only need to be rough, and employees should only receive a short time with which to think of their responses. If there is a particularly challenging question, provide a time limit of five minutes. Employees form teams of at least two people who have shared a work experience – e.g., working on a project together. One person shares an experience from working together that was negative for them. Then, the second person reflects on the same experience but instead reflects on the positive aspects of the experience (i.e., the ‘silver lining’). Then this same person shares their own negative experience, and this time it is up to the other person to focus on the positive aspects of it. Often, when people reflect on an experience, they do so with a particular perspective. By looking at the positive aspects of a ‘negative’ experience, this helps individuals shift perspectives. Furthermore, by sharing experiences, employees develop deeper relationships, and team bonding is promoted. 8. My favorite brand (Training Course Material, n.d.). Ask employees to bring three or four printed logos/brands that they use regularly or admire most. Then, form groups of 3 – 4 people. Teams have a period of ten minutes to share and discuss their chosen logos. Their task is to agree upon the team’s top 2 logos or brands which is their team’s choice. The team also selects a team spokesperson who will report to the bigger group about why the team chose the specific brands/logos. Participants are encouraged to share personal experiences or stories that they had with their chosen brand. After the ten minutes elapses, each spokesperson presents the logos that the team began with as well as their two top chosen logos/brands. It is their role to explain to the group why the team voted on their top brand/logo. Even though in the corporate world the terms manager or leader are used interchangeably, these are very distinct roles. Small groups of managers work together to create two tables, one titled ‘leader’ and one titled ‘manager’. In each table, the group writes statements describing either management behavior or leadership behavior. For example, the ‘manager’ table may contain statements such as “schedules work to be done” or “delegates tasks”. On the other hand, statements in the ‘leader’ table could be “motivating staff” and “creating culture”. The purpose of this activity is to demonstrate to managers the difference between management versus leadership, and show that while ‘every leader can be a manager, not every manager can be a leader’. However, by brainstorming leadership behaviors, managers begin the process of becoming a successful leader. This activity encourages leadership behaviors. To begin with, write a list of leadership qualities – approximately 10 – 20 statements – on a piece of paper. Describe the qualities – e.g., ‘I determine everything that happens to me’, and ‘I will not blame others for my problems’. Read these statements out loud, and participants take a step forward if they believe a statement describes them. They must be prepared to give reasons as to why they think they possess each quality. Continue reading the statements until there is a definite ‘winner’. 3. The best team member (Training Course Material, n.d.). Divide the group into teams of about 4 – 5 participants. Give each team a large, blank piece of paper and markers. Each group has the task to come up with as many characteristics of their ‘ideal’ team member as they can. Teams should consider what this ‘best team member ever’ would be like. After ten minutes, the groups should examine the characteristics that they have written and work out the portion which are ‘technical’ skills and those which are ‘interpersonal’. The aim is to work out whether most of the traits can be classified as technical or interpersonal skills. Teams usually come to realize that interpersonal skills in employees are especially critical and that these have a tremendous impact on the quality and quantity of workplace performance. This activity can be adapted according to the setting. For example, if the focus is on leadership development, teams could discuss their ideal leader/supervisor. 4. The importance of feedback (Training Course Material, n.d.). Divide the group into three teams. Provide each team with poster paper and markers or pens. Team A is required to consider as many reasons as they can that would make them apprehensive to provide feedback to another person. Team B is asked to consider what feedback can help them so, i.e., what feedback will help them accomplish. Team C comes up with as many things as they can that would make a feedback session effective. Each team has 15 minutes to brainstorm their ideas, then, each team can present their ideas. Point out to Team A that the hurdles they suggested are self-imposed ideas that will lead to the manager fearing the worst. Instead, managers should be encouraged to share feedback on a more regular basis to gain the necessary experience in having such conversations. Furthermore, by having an awareness of the most effective way to prepare and deliver feedback can help a manager conquer the issues holding them back. Point out to Team B that providing constructive feedback as needed is imperative for developing a productive work environment. A feedback discussion that is well-planned and thought out delivers an opportunity to share what you have noticed about another person’s job performance and bring about productive change. Finally, after Team C has shared their ideas, point out that effective feedback is specific, honest, and backed up with evidence. The feedback will help others to come up with goals, make and reinforce positive changes, promote self-confidence and encourage action in the workplace. Thank all the teams for their participation and input. 5. ‘Shark Tank’ (Deputy, 2018). This activity is derived from a famous TV show that gives people a chance to show their entrepreneurial skills. Managers may work individually or in groups. The aim of this activity is for employees to come up with a business plan that outlines the steps of how to build a successful company from ‘startup’. Once the managers have a plan, they can create a ‘pitch’, which should contain the brand’s name, its’ tagline (or slogan), a detailed business plan, a detailed marketing plan, financial predictions (sales, profits and market) and potential problems (competition, lack of resources). In a role play, appoint a few chosen managers to be the ‘sharks’ (the ones who consider the projects’ merit and offer imaginary ‘investments’). The winning group, or individual, is the one who raised the most money from the ‘shark’. 1. The Human Icebreaker (Stepshift, 2016). This is a simple activity that can alleviate tension and promote discussion and contribution. Participants devise a list of questions that relate to people generally – for example, “who is left-handed?”. Participants then discover which team members meet the question’s criteria. After 10 minutes, the participant who has the most answers wins. This activity promotes communication and helps team members build inter-personal skills. This quick activity can help as an ice-breaker and provides a flexible option for team building. Create a list of trivia questions that are related to the workplace. For example, “how many people named ‘John’ work in the accounting department?” or, “how many people work in the IT department?”. Read the questions out loud to the whole group. The employee with the most correct answers at the end is the winner. The participants imagine that they are on a plane which has crashed on a deserted island. They are allowed to select a specified number of items from around the workplace that would help the group to survive. Each chosen item is ranked in importance. The whole group must agree on their decision. This activity helps with creative problem solving and collaboration. Each team works together to come up with an imaginary cover story of a magazine, about a successful project or business achievement. The team designs the images, headlines, and come up with quotes. Relying on cooperation, this is a good problem-solving and communication activity. Participants stand shoulder to shoulder in a circle. Then, they put their right hand in the hand of a person who stands across from them. They then put their left hand in the hand of another different person (but not someone standing directly next to them). Participants are required to untangle the human knot without breaking the chain. If the chain is broken, the participants must start over. This is a fun activity that is suitable for both indoors and outdoors. Although it requires the necessary equipment (i.e., camera, tripod, and microphone), teams enjoy it. Employees should work in large groups (more than eight people) and divide responsibilities. Teams work together to come up with scripts for a 5 – 7-minute movie. This activity can provide an alternative to making a movie. Employees work together, spending about one-hour planning and writing a play and taking a further 15 – 20 minutes to ‘perform’ it, keeping in mind that it is designed for radio. Each participant places their chair, in no particular order, around the room. The room should be cleared of tables and other furniture. Each person should sit on their chair, pointing in a different direction. Then, request one manager to volunteer and come to the front of the room. Their task is to walk slowly back to their empty chair and sit down. If their chair is occupied, they can move to the next empty chair available and sit on it. However, everyone else has the task of stopping the volunteer from sitting down. Only one person at a time can stand and move. No one can make two consecutive moves. A person cannot sit on the chair that they have just left. Once the activity begins, the room is required to be silent. No one is allowed to touch the volunteer. Give the managers 2 minutes to come up with their strategy. After every round, the participants should discuss what happened and select a new volunteer for the next round. The team is given 2 minutes preparation time each round. It is important that the volunteer’s movement is kept at a slow walk. At the conclusion of the activity, it is beneficial for the team to discuss the activity. They may reflect upon whether they need a leader, what made planning difficult, whether everyone agreed on the plan, and what would make the task easier. Provide vector shapes on separate pieces of paper (they can be shapes of signs, objects or merely abstract shapes). Participants sit in pairs, back-to-back. Employee A is given a sheet of paper and a pen, and employee B is provided with one of the printed shapes. The aim of the activity is for employee A to draw the shape relying only on verbal instructions from employee B. Person B cannot only tell the other person what the shape is – he/she is only able to provide directions about how to draw it, or to describe its uses. Each team has two 2 minutes to draw the shape. 10. ‘All Aboard’ (Stepshift, 2016). Teams use various materials, for example, pieces of wood or mats, to build a pretend ‘boat’. All the participants must stand on the ‘boat’ at once. Then, pieces of the ‘boat’ should be removed. The team should still strive to stand in the diminished space on the ‘boat’. All Aboard can promote communication, problem-solving and critical thinking. Participants are divided into teams of between four and eight people, and each team elects one leader. To prepare the activity, record words that have one less letter than the number of people in the team (i.e., if there are five people in the team, a suitable word could be ‘book’ which has four letters). Randomly select a word, and then the teams have the task of making the word using only their bodies. Each team member moves and bends their body to form a letter. The team leader can direct their team. What stands out to me from this article is the complexity of leadership. This article demonstrates that even if one is not a ‘natural’ leader, there are plenty of activities that can promote leadership skills. Even children can develop leadership, and what’s more, have fun with activities at the same time. What do you think espouses leadership? Do you think that there are people who might tend to be leaders more than others? Perhaps you have a story about a leadership activity you have participated in or delivered – I would dearly like to hear about your experiences.